This BioProvince (as defined by Armen Takhtajan) comprises the Atlantic and Gulf states of the United States from New Jersey to Florida and west to southeastern Texas. The coastal plain is largely composed of sedimentary rocks mainly based on Late Cretaceous to Holocene deposits. The climate is equable with small to moderate annual temperature fluctuations while rainfall is abundant and well distributed throughout the year. The area includes a number of endemic genera and hundreds of endemic species with over a hundred endemic species just within the Asteraceae. The endemic Leitneria floridana, which occus in scattered locations in Florida, Georgia, Missouri, Arkansas and Texas, was originally treated as the only species in the family Leitneriaceae of the order Leitneriales but recent genetic research has placed it in the family Simaroubaceae. 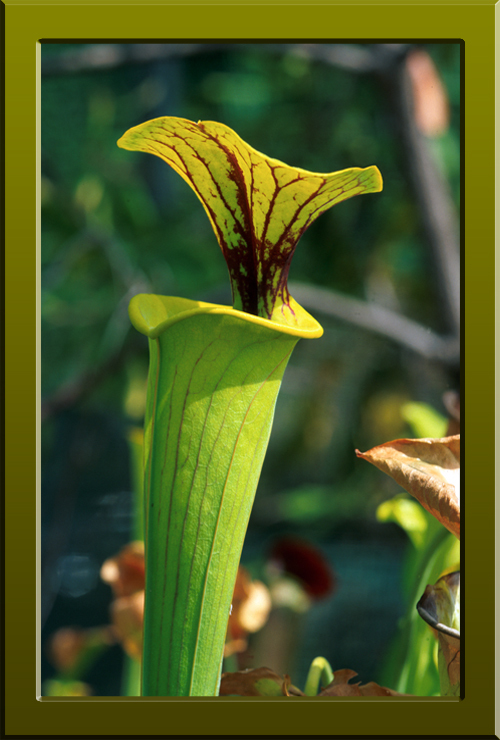 Sarracenia flava (Saraceniaceae) a carnivorous pitcher plant native to the New World that can grow to heights of over a metre. Its range extends from South Alabama through Florida and Georgia to the coastal plains of Virginia and South Carolina (Copyright © 2010 Peter Martin Rhind).